The Polaroid 72mm Close-Up Filter Kit (+1, +2, +4, +10) is a set of 4 close-up lenses for use in achieving macro-like results with almost any lens you pair them with. Close-up lenses are essentially diopters that you place over your lens in order to lessen the minimum focus distance by the amount specified on the filter. You can combine the filters together to increase their strength and to fine tune your close-up settings. These filters are constructed from premium grade optical glass and feature dual threads for ease when combining with other filters. A ballistic nylon filter wallet is included with the kit for protection and keeping your filters together. +1, +2, +4, and +10 strengths allow you to vary and modify your desired close-up amount. Box Dimensions (LxWxH) 8.3 x 4.2 x 1.3"
72mm Close Up Lens Kit (+1, +2, +4, +10) is rated 4.2 out of 5 by 6. Rated 4 out of 5 by Spelunkie from Nice for starters I use these filters together with a macro adapter for Fuji Real 3D W3 camera. The filter bag is a nice addendum, and filters work fine in general. One negative aspect, however, is that you can't add up the filters together to achieve larger magnifications, as the curvature of some lenses precludes the use of the others. Not that I recommend doing this in the first place: I also think they add too much chromatic aberrations, and some distortion at the edges of images, specially in the larger magnifications (mainly in the +10). But if you just want to have fun with near macro photos, without dead serious commitments, specially with expensive macro lenses, these close up filters are a good way to start. Rated 5 out of 5 by Chelsey from Great Add-Ons I recently discovered these filters when doing a styled shoot. Everyone I have worked with saves to get a macro, and then uses it for the rings alone and let's it sit in their bag otherwise. These affordable filters give me the option to take that detail shot with crisp detail and not feel bad that I have thousands of dollars worth of equipment that I hardly every use. Great for wedding details at different focal lengths! Rated 4 out of 5 by DPphotos from Great intro to Macro Photography I needed to do a macro photo for a course I was taking. I was not ready to purchase a true macro lens, so I opted for the close up kit. There is quite a bit of distortion and a very shallow depth of view using the +10. This kit will serve me well until I am ready to invest in a true macro lens. Rated 4 out of 5 by Jim from Better than I expected I expected more edge distortion, especially with the +10. I'm please with the results so far, mostly nature close-ups of bugs, leaf abstracts, playing with shadows and light, and native flower details. I like them. Rated 4 out of 5 by Donald from Not bad at all! Its not about how expensive an accessory is, its about finding a way to use it to the best of your ability. Sometimes you get unexpected but interesting results from low price equipment. Dont be afraid to try. Rated 4 out of 5 by Chuck from Good value for the money Four nice lenses for the money. They seem to work well, but I don’t see the need for a 1X. 10X has tiny scratches that I can’t seem to get out, but they aren’t visible in images. I’m pleased. what is the maximum magnification of each lens? A Close Up Lens magnifying is power measured by what distance the focus plane is when the lens is focused on infinity. +1=1 meter, +2=1/2 meter, +4= 1/4 meter and +10 =1/10 meter. You can of course, move the focus ring and get even closer. How much closer will depend on the lens. By the time you are using the +10, the object is only a few inches, if that far, from the front element of the lens. Will these work with my Canon T6 18-55 and 75-300 lenses? Both your Canon 18-55mm and 75-300mm lenses have a 58mm filter thread. You will need this step up ring to mount the 72mm Close Up Lens kit. 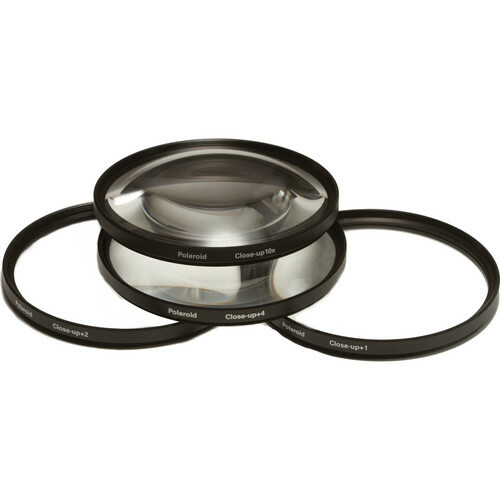 Sensei PRO 58-72mm Aluminum Step-Up Ring B&amp;H # SESURPA5872. Are these metal or plastic rings? They are metal and have a good weight to them. I've been very happy with mine.